Buckle your seatbelts and get ready for THE HEATH SHOW! A one-man, high-energy, comedic adventure! 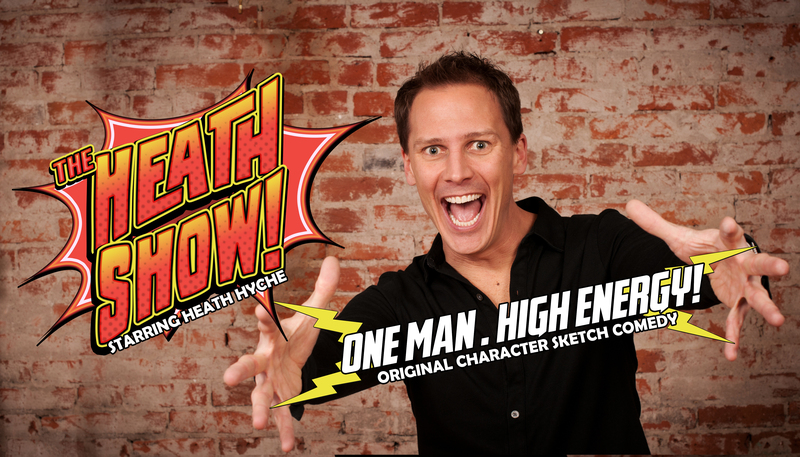 Heath Hyche uses stand-up comedy, quick-change costumes, original music, unique props and video to take the audience on a one-of-a-kind journey through his vivid imagination full of manic characters. Heath’s television credits include “The Tonight Show”, Jeff Foxworthy’s hit sketch comedy show “Blue Collar TV”, CMT’s “Comedy Road Show”; NBC’s “Late Night Stand-Up”, Roseanne Barr’s “Saturday Night Special”, “Last Comic Standing”, FOX’s “Jack’s House”, CBS’ “Drive” and “Style and Substance”; and the lead in the ABC pilot “Mark of Greatness”. Throughout his extensive career, Heath has headlined at countless comedy clubs across the country including the world famous Comedy Store in Hollywood, CA, The Hollywood Improv and The Hermosa Beach Comedy and Magic Club; as well as numerous performing arts centers and comedy festivals. He is also a favorite guest entertainer on Disney, Norwegian, Royal Caribbean Cruise Lines. You may have seen Heath on the big screen in Jim Carrey’s “Man on the Moon”, “Odd Couple II” with Walter Matthau and Jack Lemmon or “These Ol’ Broads” starring film legends Joan Collins, Shirley MacLaine, Debbie Reynolds and Elizabeth Taylor. Heath has also toured with and opened for some of the world’s most famous entertainers including Michael Bublé, Jeff Foxworthy, Larry the Cable Guy, Wynonna Judd, Brooks and Dunn, The Righteous Brothers and the late, great Ray Charles. A Birmingham, Alabama native, Heath’s southern charm brings his hilarious and creative world to life for adults and families alike. 9-11 Arizona —- More details soon!